UC Browser has launched version 12.9.7 which has fasterer speed, rich content. UC has also redesigned the UI to offer trendy and enjoyable video content. 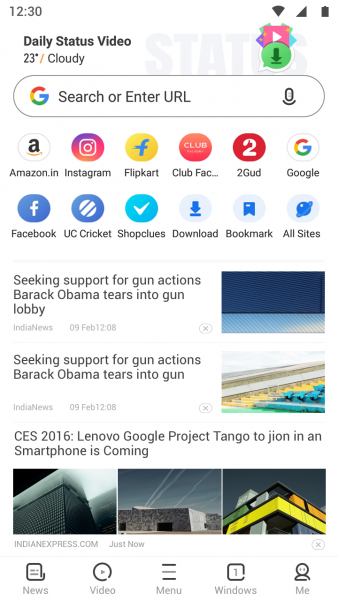 As a user-oriented content platform, besides fast browsing and downloading, UC Browser provides enjoyable and customized contents for trendy topics, entertainment, cricket and politics through UC News Feed. Used by 130 million users, this browser includes 15 local languages such as Tamil, Telugu, Marathi etc. Version 12.9.7 has made upgrades on video content exclusively for Indian market. To better feed the local appetite for short video in a social scenario, UC Browser now displays WhatsApp Status videos in the form of video feed, for quicker viewing and downloading. Users can log on WhatsApp to share or download status videos via UC Browser. According to internal study at UCWeb, short videos have garnered increasing popularity in India. UC Browser has split the original video tap into “UC Show” and “Recommend” featuring vertical and horizontal short videos respectively. Also, UC Show supports non-buffering with WiFi connection. While keeping the browser fast, UC has upgraded the user interface to make it all-in-one and immersive. The color of the status bar is now consistent with that of the browser, featuring a refreshed look. Website recommendations are redesigned as Topsites, an aggregation of popular sites catering to users’ diversified interests and navigation habits. UC Browser has initiated the “Find Diyas, Win Prizes” campaign to mark the launch of this update. Users can now obtain more UCoins with the addition of credit tasks. Besides reading, sharing and commenting on news, users will be rewarded with 5 UCoins each by finishing tasks of searching, website viewing, video playing, bookmarking and downloading. The aforementioned upgraded functions will concurrently contribute to more UCoins, which can be exchanged for prizes. Besides, users will be able to redeem these coins for rupees – which would be Rs 130 crore in total through UC Centre every week. Rewarding : Each user can obtain Rs 100 through UC Centre every week.